If you’re in the market for a new Windows Phone from AT&T and don’t mind saddling up with a new 2-year contract, both the HTC Surround and Samsung Focus are available for $0.01 from Amazon Wireless. The hidden cost in deals like this one are costs associated with the plan. 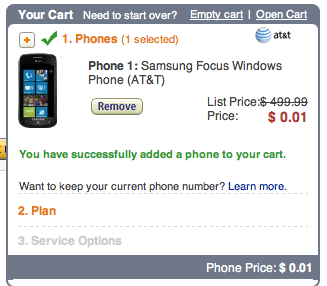 If you happen to be out of contract on another carrier, moving to Windows Phone for a penny is a bargain. I got mine last week from amazon! It’s also important to note that it’s tax free (depending on state) and free shipping! Although, looking at my bank statement, I was charged a dollar instead of a penny. I’m not really complaining as I’m sure it’s probably some kind of minimum charge or something between stores, credit cards and banks. @ninjaap, are you happy with the purchase from amazon wireless? I am about to do the same to get a samsung focus. The plan rates are the same as they are from the AT & T store, and the only difference being that you can’t change your plan for the first 6 months – is that right?